Today we continued with our Valentine theme. Our project today was to make a little "person" from a heart. This is very fun for the children because it is one of their first experiences with symmetry cutting. 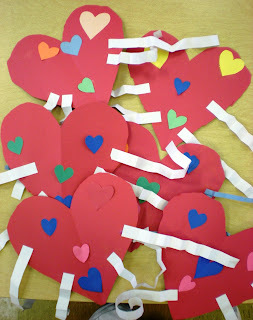 I give each child a folded piece of 12 x 18 red construction paper with half a heart drawn on it. I let them cut it out and Ta-Da--they have a whole heart. The amazement in their eyes is just overwhelming, smiles and giggles galore. Trace half a heart on a folded piece of construction paper. 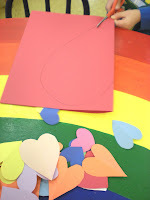 Allow the children to cut the pattern out to create a full heart. Then let them use the various hearts to add eyes, nose, and mouth. will usually fold three and let them fold one. Their folding is usually over top in one continuous direction, but at least they are trying. Glue on the arms and legs and the person is done. 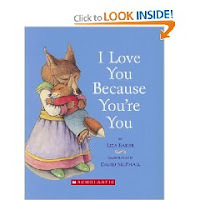 Our book we read today was "I Love You Because You're You," by Liza Baker, illustrated by David McPhail. The title says it all. A very endearing story about a little fox and his mom, good rhyming words too. There's way too much fun going on in your classroom- great job! I love seeing all of the kids work. Lots of great ideas to guide them with fine motor and creativity. LOVE your book choice, and I love you "heart people". You are an awesome preschool teacher!